The top 10 things to do in Sydney include the Harbour Bridge Climb, the harbour but not the Opera House. 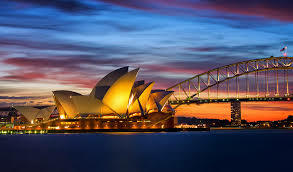 The Sydney Opera House does not make the top 10 things to do in Sydney but it is listed. The Open Air Cinema (ranked 7) is a ‘must see’ if you are here when it’s on. What sort of things can you do on the Sydney Harbour Bridge other than just cross over it? You can climb it, there’s the Harbour Bridge Pylon Lookout and the Sydney Harbour Bridge Climb (see below). That’s surely it right? Well no, you can go under it, a ferry to Darling Harbour (ranked 3) will do that quite nicely and then there’s flying over it, which is pretty good too. On special occasions you can run or walk down the middle of it. The Harbour Bridge Climb is easier than it first appears as the gradient leading to the top of the bridge is not that steep. Negatives are the cost, the long period of preparation and ‘training’ before you go up, no cameras (they will sell you photos) and it can also get a little sweaty in their ‘fashionable’ grey suits. The Bridge Climb is an experience and a half, a must do, particularly if you like being chained to something. If you can, avoid climbing the Harbour Bridge in the middle of the day. You are more likely to enjoy yourself if you are feeling cool and relaxed. 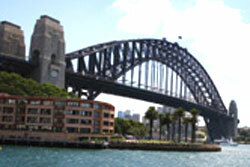 Climb the Harbour Bridge alongside someone you like (or like the look of). Once you start that’s it for the duration. No trading places. Having sheltered on the Sydney Harbour Bridge whilst we waited for a storm to pass, I can testify that the weather has to be pretty bad for the Bridge Climb to be cancelled. Around the same size as the Eiffel Tower, the Sydney Tower gives you a pretty good view of Sydney. If you choose to Skywalk outside of the Sydney Tower Eye it gets even better with a complete view of the entire city. You could say it is a real eyeful, maybe they should change the name (again) to the Sydney Eyeful Tower. Being twice as high as the Harbour Bridge, this is the best view in town. 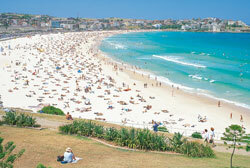 It is also a lot cheaper, takes up less time and is easier to do than the Sydney Harbour Bridge Climb. Against this, the Bridge Climb will feel like more of an accomplishment, hey! You have just climbed the Sydney Harbour Bridge! There is nothing to stop you from doing both of course. Whichever you do you will be mesmerised by the sight of the most beautiful city in the world stretching out beneath and all around you. You came to see Sydney didn’t you? Now you have. That would be it for most bridges, but the Harbour Bridge has another quality most others lack. You can look at it! Now that’s daft right? Of course you can look at it! But our bridge gets looked at from all over the place – from Sydney Heads and Sydney’s Harbour Islands to all sorts of wonderful places, it’s there. Take your camera around the Rocks area for some stunning views. Then there’s Kirribilli and Milsons Point on the North side of Sydney Harbour. The issue maybe too many photographs but hey, it’s a good-looking bridge, just enjoy it. There are a few different ways you can make you way across the Bridge. Below you’ll find link to our links page which also covers this topic and should assist you in crossing the bridge by car without incurring a fine. The Open Air Cinema is another must. Located close to Mrs Macquaries Chair in the Royal Botanic Gardens (ranked 9), it is the most expensive, hardest to get into and the most ‘must do’ of a number of outdoor cinemas in Sydney. With drink to hand, big screen in front of you with Sydney Harbour, the Harbour Bridge and Sydney Opera House as a backdrop, the Open Air Cinema is sure hard to beat. If the movie is getting dull just admire Sydney at its best – at night. Sadly, the Open Air Cinema is only open during the summer. Book your ticket well in advance and arrive as early as possible. Reasonably good ‘nosh’ and drink are available. Reserve your seat as soon as you get in and then, if you can, grab a table. When you’ve finished eating please give up the table to someone else. Expect to have to wait to get out and it may take you a little while to find a cab. Better option is to drive. If you arrive early enough you should be able to park in the Domain on the road to Mrs Macquaries’ Chair. If you’re staying in the city consider walking. We urge you to book your tickets ASAP as the best shows will sell out in days, if not hours. You’ll find the Moonlight Cinema in Centennial Park. It doesn’t have any seats, it is more of a BYO (Bring Your Own – see below) affair. None-the-less it is well worth going to, it just lacks the ‘Wow’ factor of the Open Air Cinema. Bring Your Own (BYO) is an Aussie institution favoured by the majority of Sydney restaurants and cafes. The major exception to this being high-class, expensive restaurants. It is a wonderful concept as it means you can drink some of that fantastic wine you bought during your trip to the beautiful Hunter Valley (ranked 25). BYO rules and charges (corkage) vary. It is increasing common that you are only able to BYO wine, not beer or spirits. Corkage maybe charged per person or per bottle, it can even be a mixture of both. There is no standard way of charging it but BYO rarely costs much. Please check before you order to avoid any unpleasant surprises when the bill arrives. The 35 kilometre trip or so up to Palm Beach will make you feel at Home whilst you’re away, if you like your Aussie soaps that is. 🙂 An hour or so drive from the airport, Palm Beach was my first stop and should be yours to if you love beautiful beaches. Palm Beach is a very idyllic location with more than its fair share of resident millionaires. Palm Beach is at the end of the peninsular so the ocean beach and Pittwater are just walking distance apart. You can hire a boat and go for a paddle down Pittwater. The excellent ‘Boathouse’ on the wharf is a wonderful spot to grab something to eat, soak up the scenery and watch the seaplanes land and take off. There is a track up to the Palm Beach Lighthouse to enjoy. There is also a slightly hard to find public footpath at the end of the road, by the swimming pool, at the southern end of Palm Beach. Be blown away by a scenic flight over Sydney Harbour and then by the aerial views of Sydney’s gorgeous Northern Beaches before gently splashing down on Pittwater at Palm Beach. Dine in style at the upmarket Jonah’s Restaurant before being flown back to Rose Bay. This will be a very special day that you are unlikely to forget. How Do I Get To Palm Beach? The L90 bus regularly runs all the way to Palm Beach from the bus terminus near Central Train Station. It’s a long journey in excess of two hours. On the way you will get to see the Harbour Bridge (as you travel over it), the Opera House, glimpses of Balmoral, Middle Harbour, Long Reef, Narrabeen and magnificent views into Palm Beach. Sounds good doesn’t it. Trouble is you will see far more of the road and traffic than the sights. The neighbouring Whale Beach is arguably a ‘better’ beach than Palm Beach but it doesn’t have as many cafes and restaurants. The trees along the edge of Whale Beach offer lots of shade, it has BBQ facilities, an ocean pool and a children’s play park right on the beach. Understandably, it is popular with families. Bilgola Beach can be found just south of Palm Beach and Whale beach. This is a beautiful spot surrounded by bush and if you’re lucky, peace and quiet. Bilgola is an excellent chill out if you avoid weekends and/or arrive early. You’ll discover a pleasant kiosk by the beach and an ocean pool if you don’t like the look of the Bilgola waves. Australia excels in many ways and is, sadly, top of the skin cancer league. Slap it on every time you step outside. The sun here is a killer. As anyone who’s experienced it will testify, sunstroke is extremely unpleasant and will cost you at least a day or two of your holiday as you recover, so bring or buy a hat. The Royal Botanic Gardens is a beautiful park on the foreshore of the most beautiful harbour in the world. There’s a cafe in the middle of the Royal Botanic Gardens where you can compete with creatures of various sizes for your lunch. Alternatively bring your own, find a patch of grass and watch the boats go by. The Royal Botanic Gardens is a must place to visit and it won’t cost you a cent. Explore the world of plants and the history of Sydney’s magnificent Royal Botanic Gardens with a knowledgeable Royal Botanic Gardens volunteer guide. All tours depart from the Information Booth outside the Gardens Shop at the Palm Grove Centre. The only problem with Mrs Macquaries’ Chair is its popularity – beware the tourist bus (if you’re riding on one sit at the front and get off first!). Best bet is to arrive early morning or late afternoon. Mrs Macquaries Point offers classic Sydney Harbour Bridge and Opera House views and a great vantage point for photographers. If you want to avoid having the ugly Blues Point Tower appearing in the background of your photos move south along the point, at the right angle it will be suitable obscured. Phew! We haven’t even got to Bondi yet (next page).